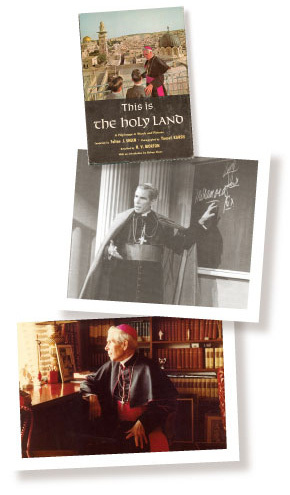 The Archbishop Fulton John Sheen Foundation is in the process of creating a museum where we can present Sheen's life work for all to see — a single, central location where the artifacts from his life can be safely stored, preserved and shared with world. The Archbishop Fulton J. Sheen Museum, located in his home Diocese of Peoria, Illinois, will respectfully and professionally preserve and share the memories of his life and his works — as well as his impact — in a manner worthy of this notable and holy man of God. Already assembled are writings, books, photos and a selection of his vestments and Episcopal regalia, including an ornate throne donated by Sheen's family. The museum sits on the campus where Sheen graduated from high school and is a block away from the Cathedral of Saint Mary of the Immaculate Conception, where Sheen attended grade school, learned to serve Mass, and was ordained a priest on Sept. 20, 1919. Sheen never forgot his Peoria roots and the city and the Diocese of Peoria are proud that he is our gift to the Church and to the world. If you own any Sheen artifacts or memorabilia, please consider preserving these items by donating or loaning them to the museum. You can also help by making a monetary donation, sponsoring a display. Donations will receive recognition on a memorial wall. To contribute, call 877-71-SHEEN.